For the launch of Melissa Shoes first U.S. location the Bennett Sisters teamed up with the brand to create an in store exhibition entitled The Future of Her. The project was an immersive experience created by artists Signe Pierce and Sam Cannon in a space designed by architect Muti Randolph. 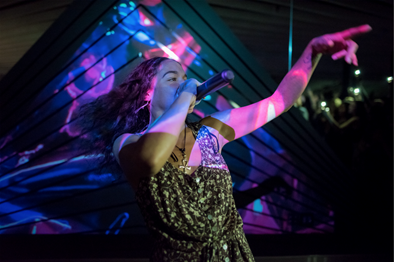 The opening event featured a performance by rapper Princess Nokia. Our mission is to manifest a representation of a female constructed and infused environment and alternate dimension that exists in harmony with technological advancements that are natural and inevitable in our evolution as humans, as a society, and a planet as a whole. The digital immersion of natural elements such as plant life and water complementing the futuristic architecture of Muti Randolph pays homage to the divine female and her supreme level of expression in the universe in all her measures. Sam Cannon embracing her past work with prism and illusion, Sam Cannon’s digital art will live within the geometric construct of Muti’s pyramidal and polygonal LED presentation. This prismic illusion of mirrors flooded with water expresses and personifies the divine feminine gift of self reflection and benevolent power that enables infinite possibilities of mind expansion, healing, creation, and harmony. Signe Pierce reflecting culture’s current reality where the separation of an artist’s work and life are rapidly disappearing Signe Pierce takes her coined concept of “electrotexture” to another level of immersion in an isolated room within Galeria Melissa. “Electrotexture” as she explains it is the mergence of light, liquid, and media. The projections of brightly colored moving liquids on the walls emulates the fluidity of existence by unifying its duality. The Future of Her dissolves the rigidity of extremes into a state of coexistence and harmony with the force of creation being at the essence of femininity and the unabated female in an ideal world creating infinitely without boundary or sacrifice.